In hopes of educating Portland electric scooter riders about local rules of the road, the Portland Bureau of Transportation has turned to a low-tech solution: paper flyers and rubber bands. PORTLAND – The stereotypical electric scooter rider is a tech-savvy millennial on the go, with access to a smartphone and the tolerance for risk that early adopters tend to flaunt. How do you deliver an important message to this information-saturated cohort as they whiz by at the speed of a runner at full sprint? In Portland, Oregon, officials from the city’s Bureau of Transportation decided the answer was not email alerts, emergency alerts or text notifications. Instead, they’ve opted for a decidedly low-tech solution, as the Willamette Week first reported: Good ‘ol paper flyers and rubber bands. Chris Warner, interim director of the Portland Bureau of Transportation, said the goal of the flyers – thousands of which have been attached to e-scooters all over the city recently – is to remind a growing number of riders to abide by local rules of the road, which include yielding to pedestrians and parking the vehicles with care. “Sometimes, low-tech solutions are the best ones,” he added. Electric scooters hit the streets of Portland two months ago, the beginning of a pilot program that aims to monitor the impact of the new vehicles on the city. Since their debut, the city has logged more than 178,000 trips on the vehicles, as well as about 1,100 complaints from about 500 people, according to the PBOT. City officials said the complaints are largely from people reporting riders for doing things such as operating scooters without a helmet or riding on the sidewalks, both of which violate state law. Warner said the city started their public education efforts about e-scooters from the first day of the pilot program, but turned to flyers in hopes of improving public education following the wave of complaints. In cities across the country, scooter companies such as Bird and Lime have dumped their products on public streets without alerting local officials. By creating a base of loyal customers and amassing valuable transportation data, scooter companies gained more leverage before coming to the table to negotiate with city officials. 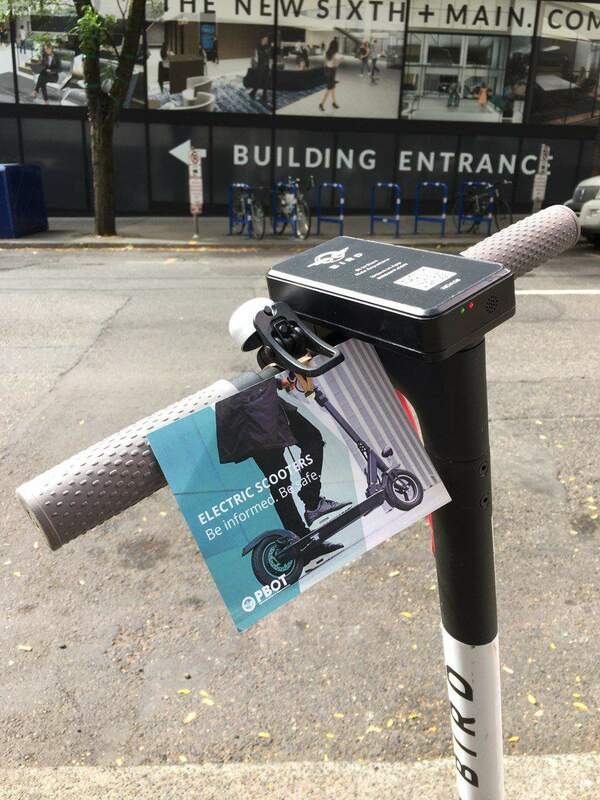 In Portland, city officials watched the emergence of e-scooters closely elsewhere and then launched negotiations with scooter companies before they had a chance to descend on the city preemptively, said Dylan Rivera, a PBOT spokesperson.